I've had several friends complete the Global City Doctor of Ministry program at Bakke Graduate University over the last few years. It's a fascinating doctoral program that I've been interested in myself but it's the old conundrum of balancing work, family and life. A few weeks ago, a friend of mine mentioned that BGU is now offering an MBA program. I went to the web site and discovered my dream master's degree: they have developed a Master of Arts in Social and Civic Entreprenuership. This program provides a balanced curriculum of business training, social entrepreneurship and theology. It's the perfect degree for someone wanting to build an academic background in the area of faith ventures and business as ministry. Unfortunately, like most master's degrees, it comes with a fairly steep price tag so you really need to analyze the cost benefit of pursuing this particular academic degree. And one must also remember the value of on-the-job experience. But if this degree had existed 10 years ago when I had the time to pursue master's work, this would have been my choice. Today, I came upon a fascinating post in Andy Crouch’s Culture Making Blog. Throughout my writings, I hope it comes through how much I value the healing nature of redemptive social networks. On the flip side, negative social networks can be corrosive as this study shows that the more time spent away from Las Vegas reduces one’s risk for suicide. One of my favorite stories is about how far we are willing to take this idea. Last year, an owner of a neighboring business discovered someone stealing copper from our yard at 3am in the morning. He called the police with a license plate number and they arrested the individual. The next day, the police called us to see if we wanted to press charges. The policeman, who was familiar with our project, suggested that there might be some other way to resolve the issue. Our warehouse director Bob Klinger offered that the man could volunteer at the warehouse to pay off what he stole. The man agreed and started working at Bud’s later that week. We really liked him and discussed him coming to work for us. But he disappeared the day after he paid off his debt. We were saddened by his departure because we thought it would be fun for him to share about the job he literally stole. I am in the process of hiring a program manager to assist in managing our job-training program at Bud’s Warehouse. In many ways, I like to apply the same standard to finding a candidate for the job. I like to promote someone from within who has succeeded in the program who can now pour his life into others struggling with the same problems. Or I like to hire someone who has succeeded outside our organization in a similar type program. I am a big believer that the most gifted Christian leaders minister out of their own brokenness. The most effective urban ministries share a common characteristic of empowering those that they serve into leadership roles. It’s an approach that was first modeled by Jesus with his ragtag troop of disciples. And it’s a direction I will continue at Belay Enterprises. Our management staff loves to share that almost everyone at Bud’s Warehouse has a past felony conviction. I think Jesus smiles at this example of his grace. Steve Pankoski of Stryan Steel Systems attended our last Faith Venture Focus Event and shared valuable insight about employing felony offenders. In his opinion, the key to success in working with past offenders is realizing that your business is God’s business. With that in mind, a Christ-centered owner, who has a God-directed commitment to hiring past offenders, is free to trust them like any other employee and serve them with the same attitude as Christ. This provides the foundation that allows felony offenders to overcome past bad decisions and reach their God-given potential. Pankoski started Stryan Steel Systems in 1995 after 16 years as a Denver area custom homebuilder. The company manufacturers and installs an innovative structural floor system that overcomes the swelling soil issues of the Denver Metro area. His labor-intensive company requires employees that are adept in the construction and installation of these systems. As a result, there are many ideal employment opportunities for individuals transitioning from prison into the work environment. Pankoski’s commitment to working with felons began after locating his company’s office next to a half-way home for individuals re-entering society after prison. What began as a relationship of convenience has now become a core part of Stryan. Pankoski takes pride in watching individuals find faith and a better life through on-the-job experience in his manufacturing company. While the non-profit faith venture Bud’s Warehouse provides job training for individuals rebuilding lives from prison, real momentum for felony career opportunities will only increase when for-profit faith venture companies discover the rewarding ministry of working with past offenders as employees. I define a faith venture as a Christ-centered business that employs individuals or communities rebuilding lives from addiction, homelessness, prison, or poverty. Many of my posts to this blog discuss faith venture with an eye on serving individuals rebuilding lives from prison and a felony conviction. But faith ventures aren't limited to just felons. They can be international faith-based microenterprise funds that serve whole communities rebuilding from poverty. Or they can be domestic firms seeking to meet the needs of other disadvantaged communities. At our last Faith Venture Focus Forum, I was introduced to Billy Williams of Urban Mattress. Billy is a serial entrepreneur with extensive experience from several different business startups. His latest venture sells mattresses and sleep systems in Boulder, Colorado. The faith part of his faith venture comes in his commitment to hire recent immigrants from the Lost Boys of Sudan to staff various roles in his business. They have had to develop unique strategies to overcome language difficulties to create opportunity for this disadvantaged immigrant community while ensuring that the needs of their customers are served. Kingdom, with a vision of business as so more than a means to an end. I am excited to announce that our second Faith Venture Focus Event scheduled for November 6th, 2008 is completely sold out! Our first event on October 16th, 2008, generated a lot of enthusiasm which has resulted in 13 christian entrepreneurs signing up for tomorrow's event. We had hoped to limit the event to 10 individuals but decided to expand the number since this is the last event for 2008. We will announce future Faith Venture Focus Events for January of 2009 soon. If you are interested, let us know. I had an exciting meeting yesterday with Chris Horst of the microfinance organization Hope International based in Lancaster, Pennsylvania. Chris recently moved into the Denver area to establish a western presence for this expanding ministry. He stopped by Bud’s Warehouse for a tour and to learn more about our organization. Hope International is exploring starting a domestic business as ministry initiative sometime in the next few years. Jeff Rutt, the owner of Keystone Custom Homes in Lancaster County, started the faith venture Hope International in 1997. At the time, his church had been involved in providing short-term assistance to a church in the Ukraine. After being challenged by a pastor to find long-term solutions to poverty, Rutt was led to the growing sector of microfinance loans as a creative solution to breaking the cycle of poverty. Hope provides small loans to individuals in poor communities who are unable to obtain loans from bank sources. Over the years, Hope has grown to serve numerous countries throughout Eastern Europe, Asia, Africa and the Caribbean. 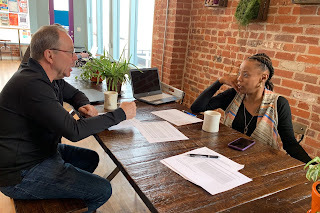 Yesterday, Chris explained to me that what makes Hope unique, as a microenterprise organization, is its strong focus on holistic ministry through its programs. They seek to not only meet physical needs through the development of small businesses but to also develop relationships that help meet the spiritual needs of the community. This approach is similar to the one that Belay Enterprises initially used in its urban Denver microenterprise program 10 years ago. Unfortunately, Belay discovered the difficulties of working in domestic urban settings because of differences in the scale of money needed to make local initiatives succeed. Where $200 may make a big difference in the business of someone in the Ukraine, a domestic microenterprise program may need to loan out $2000 or more. I shared how Belay wants to rebuild its for-profit business development goals but with the aim of providing resources through networking and teambuilding instead of only relying on small loans. I look forward to further discussions on how Belay Enterprises might be able to partner or assist Hope as they develop domestic business as ministry initiatives. I'm excited that Hope comes from Lancaster County, Pennsylvania, where my family has been involved in the building industry and the Moravian church since the 1950’s. I’ve always enjoyed the fact that the Moravian church was one of the early originators of the business as ministry movement hundreds of years ago.